Fig 1: 3D-SIM microscopy image of labeled Actin stress fibers in human primary dermal fibroblasts. Launched just over a year ago, SiR-Actin (Fig 1) and SiR-Tubulin (Fig 2) have been available on the market providing the most convenient tools to stain F-actin and Microtubules in living cells. In the meantime, Spirochrome have launched a third stain based on the SiR-technology – SiR-DNA (Fig 3) to stain DNA in living cells. Fig 2: 3D-SIM microscopy image of labeled microtubules in primary rat cortex neuron body. Tubulin polymerisation measurement – made easy! Recently, I issued a post about a method which allows measuring microtuble binding capabilities of proteins of interest. Today, I invite you to look at methods for measuring the dynamic polymerisation of tubulin to microtubules and to detect the impact of compounds or other variables in your experiments on this process. Tubulin represents one of the major cytoskeleton structures. It plays an important role in cell structure, intracellular transport, and mitosis. In eukaryotic cells, tubulin polymerizes to form structures called microtubules (MTs) (Fig. 1). When tubulin polymerizes it initially forms proto-filaments, MTs consist of 13 protofilaments and are 25nm in diameter, each um of MT length is composed of 1650 heterodimers. Microtubules are highly ordered fibers that have an intrinsic polarity, shown schematically in Figure 2. Tubulin can polymerize from both ends in vitro, however, the rate of polymerization is not equal. It has therefore become the convention to call the rapidly polymerizing end the plus-end of a microtubule and the slowly polymerizing end the minus-end. In vivo, the plus end of a microtubule is distal to the microtubule organizing center. This is the conclusion of Liu X. et al. who demonstrated, in a mouse model, that RhoA/ROCK signaling pathway modulates insulin secretion of 3D cultured islet pancreatic ß-cells. This modulation is made through the regulation of Connexin 36. Cell-permeable C3 transferase (C3T; Cytoskeleton Inc.) and the small molecule Y-27632 ROCK inhibitor (Stemgent-Asterand) were used in these studies. 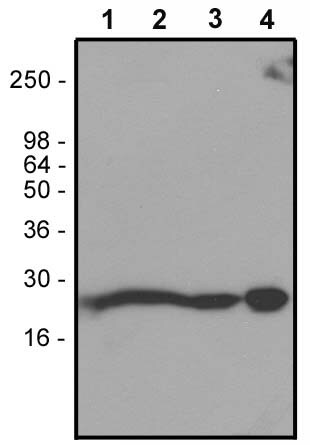 Western blot detection of RhoA (cat. nr ARH03) in cell extracts (50 µg each) of rat NRK cells (lane 1), human HeLa cells (lane 2), bovine brain extract (lane 3), and human platelet cell extract (lane 4). Selective Rho Kinase (ROCK) inhibitors and anti Human RhoA antibody (a Mouse monoclonal that only recognizes RhoA, not RhoB, RhoC, Rac1, Rac2, Rac3, Cdc42 or H-Ras). I hope you will enjoy this new publication. Don’t hesitate to leave your comments or remarks regarding the use of bioactive small molecules in signal transduction studies. Both ROS (Reactive Oxygen Species) and RNS (Reactive Nitrogen Species) on the one hand, and the small G proteins belonging to the Rho family on the other hand, are key regulators in various signal transduction pathways. More recently it has been suggested that crosstalk between reactive species and Rho GTPases plays a crucial role in some of their physiological functions. Furthermore, these crosstalk events have been linked to pathological processes, e.g. lung injury and cancer. Our partner Cytoskeleton Inc. has summarized recent findings in the newsletter Rho GTPases and Reactive Oxygen Species: Crosstalk and Feedback. Let’s take a look at what’s available for research in this area.